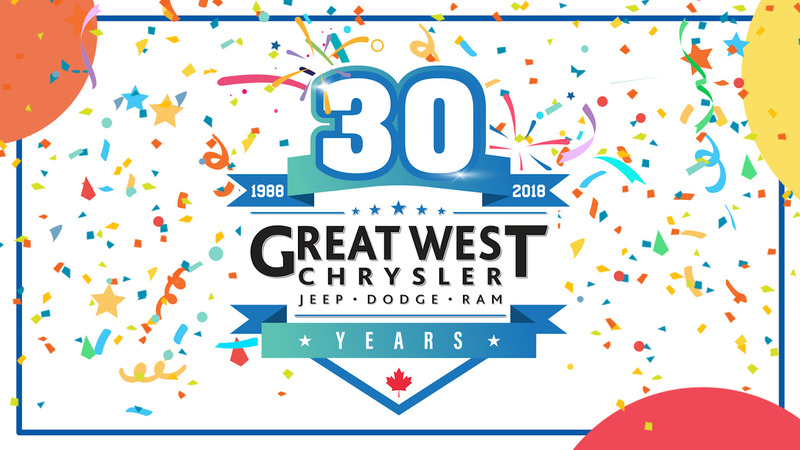 On September 29th of 2018, Great West Chrysler is turning 30! It’s a milestone we want to share with YOU. Thanks for making our dealership as great as it can be. Nearly a century after its inception, the name Chrysler still conjures an image of greatness. Founded in 1988, Great West Chrysler is proud to be Edmonton’s dedicated Chrysler, Dodge, Jeep and Ram dealer for the past 30 years. Over the last three decades, we have seen Edmonton flourish into the city we know and love today. As part of the Yachimec Auto Group, we’re passionate about giving back to the community through initiatives like supporting the Stollery Children’s Hospital Foundation. We’re also Edmonton’s top rated Chrysler dealer thanks to hundreds of reviews from happy customers. We couldn’t have done it without you! That’s why for our big 30th, we’re inviting you to celebrate with us with huge savings and plentiful prizes. We don’t get older, only wiser. $30 off hourly rate on all maintenance all September long! RSVP FOR THIS SPECIAL EVENT! We can’t wait to celebrate Great West Chrysler’s 30 continuous years of excellent service. Hope you’ll join the fun at the big event! To take a sneak peek at the great deals we have, contact us at your convenience or check out our online inventory.